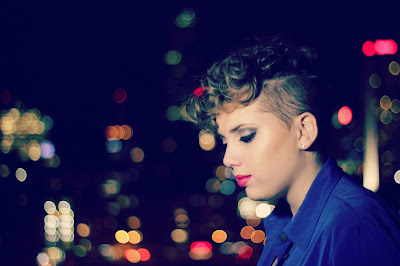 The Suburban.com - The Suburban - Mike Cohen: Brittany Kwasnik releases her second video called "City"
Brittany Kwasnik releases her second video called "City"
Brittany Kwasnik in a scene from the video. Dollard des Ormeaux singing sensation Brittany Kwasnik released her latest video last week, the second from her new CD launched in June. She shot it one Saturday evening downtown, appropriate since it is called "City. "In a Q & A conducted by her publicist Bob Dubois, Brittany was asked why she chose City as her new “I thought visually, a video for this song would really bring it to life!” she said. “I wanted to capture the beauty of Montreal, as it is the city that inspired the line ‘If I was a city, you would be my lights.’ As I was writing the song, I was thinking about the night-time skyline of Montreal, specifically from the view on top of Mount Royal. The lights from that view of the city, at night, are so powerful and breathtaking. I really wanted to share that image with everyone that listens to the song. The shoot took place on a cold Saturday evening in October. It was a very cold and windy night, probably the most chilly we had experienced since the end of last winter,” Brittany remarked. “It made the night feel quite long! We began to shoot around seven in evening, and I got home around two in the morning! Although it was lots of fun to shoot, I really wish I had considered to wear something with a few more layers for some of the shots!